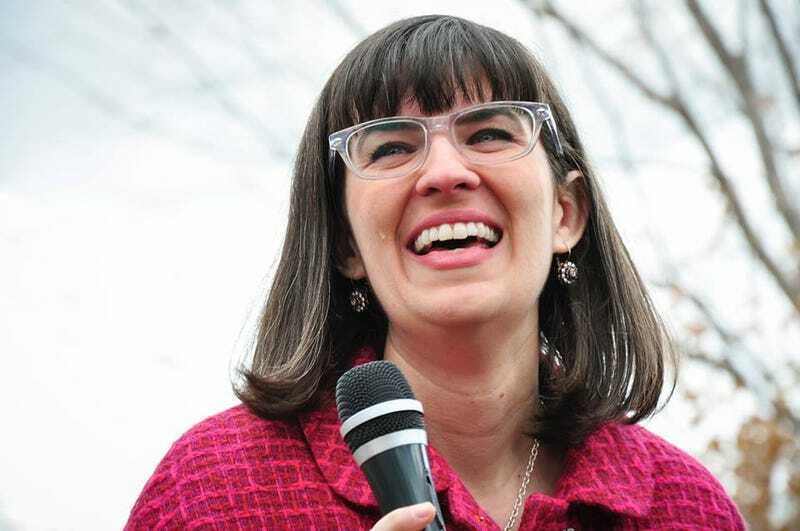 Ordain Women, an organization within the LDS church whose aim is to get women the right to take part in the priesthood, seems ready to get an answer from church leadership. And that answer is simple: if you disagree with us, go away. Founder Kate Kelly will be tried in absentia by her former bishopric in less than two weeks' time on charges of apostasy. Activist John P. Dehlin of Mormon Stories will be tried as well for his advocacy of getting gay Mormons into the priesthood. Now, Ordain Women doesn't seem to disagree with the LDS church, but base their complaint in scripture. Right in their mission statement Ordain Women cites LDS teachings which support their position - God is both male and female, and 2 Nephi 26:33 states quite plainly that "black and white, bond and free, male and female ... all are alike unto God." Excommunication in our church is akin to spiritual death. The life-saving ordinances you have participated in like baptism, confirmation, and temple sealing are moot. In effect, you are being forcibly evicted from your forever family. Given the gravity of the situation, I feel like being invited to a council of this sort is akin to being invited to my own funeral. Reading stories like this one in the New York Times are like reading my own obituary. She's still faithful, she's every bit as Mormon as the men who will excommunicate her. The only difference seems to be that she thinks the practice of excluding access to a spiritual position is sexist (it is) whereas the church does not (they're wrong). Yet, this isn't ultimately about following the writings in the book, but about doctrine and dogma. You might, for instance, point out that black and white didn't become very alike unto God in terms of access to the priesthood until 1978. It's not surprising that without serious pressure from within and without that the LDS church is still taking this stance with regards to women and gay people. I feel for these activists, and yet what's happening doesn't surprise me one bit. Doctrine and dogma are the bread and butter of organized religion, and challenging established dogma is extremely difficult to do with any success. In part that's because of the existing structure of the church - religions are quite conservative in the way they operate at an institutional level. Within Christianity alone disagreements over doctrine and dogma have led to all out war (literally) because maintaining doctrine and dogma are that important. It's also partly because of the culture the church fosters, which serves to protect the church at all costs. Dehlin's post about the charges makes no apologies and says flatly that his decisions led directly to these charges. And while he has nothing to apologize for and doesn't want any pity, he feels his family might need some consolation. Because when he gets excommunicated, his wife and children will face huge social backlash from their "very conservative Mormon town." The sins of the father indeed. Why is doctrine so important? Well, it keeps the church together. Questioning that is seen as leading people astray. So the church builds its culture around doctrine above all else - public advocacy for change is considered divisive and destructive. Which leads to posts like this, from A Well-Behaved Mormon Woman, where Mormon culture and doctrine create a feedback loop of mutual support when either is challenged. However, the most recent campaign is by far the most brazen of them all, and one that the majority of conservative and faithful members of the LDS Church will be shocked to find out (and honestly question the claims that are made) that these are, many of them, also active members of the Church... who have come together to question what they believe to be a history of withholding, and to publicly advocate for, ordination to the priesthood. This is unprecedented: that individual female members unite online to organize a campaign against LDS Church leaders to lobby for priesthood ordination — by utilizing the media as their advocates to both protect themselves and to put pressure on the Church in an attempt to force desired change. There's a lot I could pick apart there (drop of a lace hankie, really? so the fact that men control the church is only perception, not fact? interesting how "majority of conservative and faithful members" is constructed to suggest synonymy between conservative and faithful and that liberal members of the faith are unfaithful - perhaps due to their liberal values), but none of that will get us to the meat of the matter. And the meat of the matter is quite plain: the culture that comes from heavily dogmatic religions exists not for the benefit of the faithful but to serve the continued existence of the religion in as original a form as possible. What Ordained Women and Mormon Stories understand, though, is that we're in the twenty-first century. Instant mass media is upon us, and religions can feel the pressure of bad press now in ways unimaginable 50 years ago, let alone a century or more. Religions which stick to established dogma and fostering a culture of unquestioning adherence to that dogma rather than taking a more decentralized approach based on the needs of the faithful are beginning to feel the pressure of public opinion. At the moment the LDS church is confident enough in its position to excommunicate over this advocacy, but like the revision of the teachings barring black men from the priesthood or the repudiation of plural marriage (largely motivated by the fact that the U.S. wouldn't take Utah as a state unless they did so), the church will eventually bow to pressure coming from within and without. Kelly and Dehlin may be knocked down, but their causes are not knocked out.